PLEASE READ THE FOLLOWING TERMS AND CONDITIONS. All customers and users of our website(s) including all other transaction methods with No Skidding Products Inc., are subject to the following terms and conditions and you acknowledge all of the following notices and agree to all of the following terms and conditions. All data, material and information contained in the website are not guaranteed to be current, accurate or complete and is subject to change without notice. No Skidding Products Inc. shall not be responsible for any errors or omissions contained on this website nor shall No Skidding Products Inc. be responsible for any server, hardware, software, internet transmission, monitor settings, website design and construction that produces incomplete or inaccurate data, material and information that may be received and/or displayed on your internet browser. Accordingly, all data, material and information contained in the website are provided on an "AS IS" and "WHERE IS" basis. No Skidding Products Inc. MAKES NO REPRESENTATIONS OR WARRANTIES, EXPRESS OR IMPLIED, WITH RESPECT TO THE WEBSITE OR ITS CONTENTS. References, links, hyperlinks and advertising contained from the website to any third party are not approval, endorsements, or support for the third party or the third party's goods and/or services. No Skidding Products Inc. is not liable nor is any liability assumed for incompatibility, loss of privacy, invasion of privacy, privacy disputes, non-suitability, viruses, loss of service, or any other problem of any kind arising from or in connection with the third party, the third party's website or the third party's goods and/or services. You accept responsibility for ensuring the use of anti-virus products and other protective products while visiting the website or any connected third party site. No Skidding Products Inc. IS NOT RESPONSIBLE TO YOU IN ANY WAY FOR ANY DAMAGES, INCLUDING, BUT NOT LIMITED TO, DIRECT, INDIRECT, SPECIAL, ECONOMIC, OR CONSEQUENTIAL DAMAGES, ARISING FROM ANY CAUSE WHATSOEVER. No Skidding Products Inc. shall not be liable for any special or consequential damages that result from the use of, or the inability to use the materials on our website(s) or the performance of the products. No Skidding Products Inc. uses all reasonable efforts to provide up-to-date, complete and correct information on the website. No Skidding Products Inc. does not make any representations or warranties with regard to the contents provided on the website such as hyperlinks or other contents available, directly or indirectly. No Skidding Products Inc. assumes no responsibility or liability which may, in any form whatsoever, be construed from the use of this website or related thereto. Thus, No Skidding Products Inc. cannot be held liable for the exactness, completeness, actuality or intelligibility of the information presented on this website. Decisions which rely on the information available or provided on the website are solely your responsibility. The information posted on this website may contain technical inaccuracies or typographical errors. No Skidding Products Inc. reserves the right to make amendments, corrections and/or enhancements with regard to information, products and programs described on the website at any time and without prior notification. As No Skidding Products Inc. does not have control over other websites which may be linked to the website and has not seen or examined such websites. 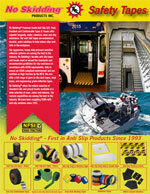 It is understood that No Skidding Products Inc. is not responsible for the contents of linked websites. The data, material and information contained on and in No Skidding's website, including, but not limited to, content, text, graphics, and the selection, arrangement and compilation contained thereof are the Copyright © of No Skidding Products Inc. ALL RIGHTS RESERVED. Certain names, domain names, logos, designs, titles, words or phrases, whether registered ® or unregistered ™, are trademarks of No Skidding Products Inc. The display of the trademarks on the website does not convey, create or grant any license or privilege of any kind whatsoever to you. Unauthorized use or exploitation of any of the trademarks displayed on the website is strictly prohibited. Data, material or information from No Skidding Products Inc. or contained on the website may NOT be copied, reproduced, re-published, posted, transmitted or distributed in any means, manner or way. You may access and use our website for private and personal purposes only and you agree not to reproduce, republish, post, transmit or distribute any of the material being used for these purposes. The use of any data, material or information for any other reason and the modification, distribution, retransmission or republication of any data, material, or information contained on the website is strictly prohibited. No Skidding Products Inc. shall not be liable for any special or consequential damages that result from the use of, or the inability to use the materials on our website or our products. The great variation between environmental factors, possible surface and application techniques, and the lack of control we have over such matters, must affect our policies. 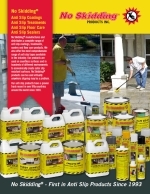 Products are guaranteed not to be defective when applied and used in accordance with instructions. However, liability, whether expressed or implied, is limited to replacement of product or refund of purchase price and cannot include liability for labor costs or consequential damages. Because of the variety of circumstances affecting each job, it is the user's responsibility to determine the suitability and safety of the product(s) for any particular application. This limited warranty may not be modified or extended by manufacturer's representatives, distributors, or dealers of these products. We particularly recommend that users always test in small inconspicuous areas before application to the entire surface.